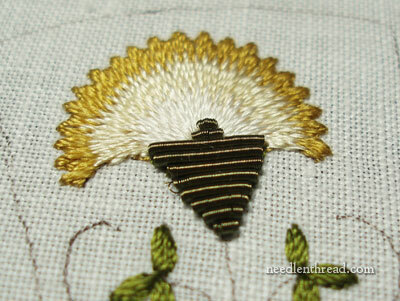 Goldwork Threads are a constant source of fascination for me! Purl (also called bullion) is a real metal thread that’s made from wire wound into a spring, to make a long, limp and boingy tube. Today, I’ll show you the wire purl that covers the base of the flowers on the Floral Glove project. First off, you’ve probably noticed that this is not exactly what we’d call “gold” – it’s a olive green purl. Real metal threads are not always gold. They come in lots of colors, actually! 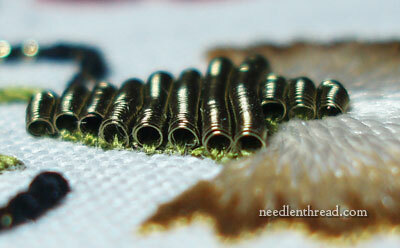 I prefer gold for goldwork, but colored purls work out well in special spots on a goldwork piece. You can see that the purl in the photo above looks like a long tube and that it pulls apart like a spring. Like other metal threads that are wound in a spring (lizardine, pearl purl, etc. ), if purl is stretched, it doesn’t bounce back. 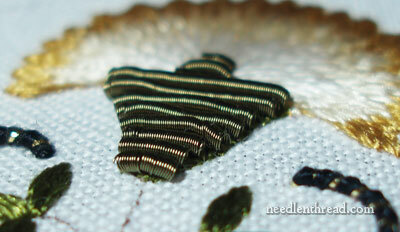 Purl is sewn onto the surface of the work in the same way a bugle bead would be sewn on. First, it is cut to the correct length, and then the needle and thread pass through one end of the cut tube, out through the other, and back down into the fabric. When you look at the whole flower this close up, it’s not all “that” noticeable. There’s a bit of wonkiness there, but it’s not too upsetting. It’s a little more noticeable at an angle! The purls on the second flower look much better. They still have their little imperfections, but that’s ok! See the little coil jumping out from the side? I’ll tell you about that! When I cut purl, believe it or not, I use my fingernails. Ok, ok – not to actually cut the wire, but I do use them to help me measure where to cut the purl. I nudge my fingernail between the wires to form the tiniest separation, so that I can then use my scissors in exactly that spot. But fingernails can also be the worst enemy of a piece of purl. In the case above, as I was sewing the purl on, I caught it on a fingernail and the wire boinged out. No problem – I went back and cut that off later. In other cases, I’ve accidentally driven a fingernail straight into a piece of purl already sewn onto the fabric, causing the purl to crack and look just awful. So while fingernails can be a handy marking tool when you’re working with purl, they can also be hazardous to your purl! 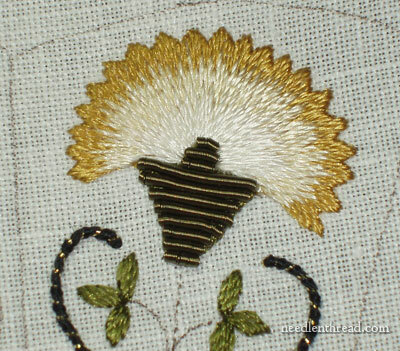 Enough of a reason to trim them down before doing this kind of goldwork? Actually, for me, yes – if I were going to be working with a lot of purl, I’d definitely trim my fingernails first! 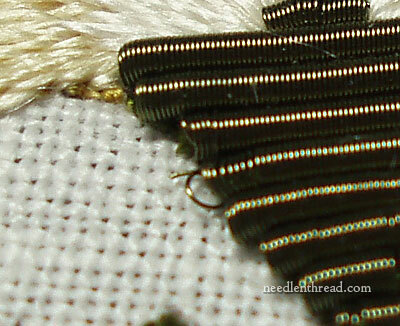 So that’s a little glimpse of wire purl used in real metal thread embroidery. 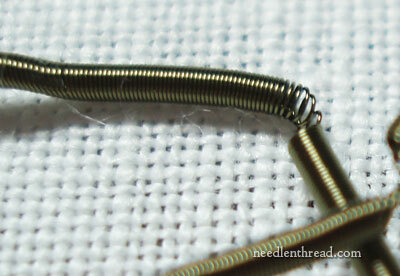 It’s a neat metal thread – if you ever get the chance, try it out! I like the look of green purl. It’s more ‘me’ than gold. Thanks for all the tips and info. All of good interest. I didn’t know that these type of purls can be used so beautifully.In India we get gold as well colored ones but we use it for making jewelery.The idea is really great. I am in embroidery business since 20 years,It our ancestoral work we are in this business for 80yrs.I am very impress with your idea. I need to keep in touch with you.How it is possible.